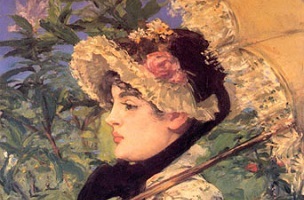 A report in the Inside Art column last Friday about plans by Christie’s to auction Manet’s “Le Printemps” in November referred incorrectly to the painting’s history. It was not included in the exhibition “Impressionism, Fashion and Modernity,” which opened at the Musée d’Orsay in Paris in 2012 and traveled to the Metropolitan Museum of Art and the Art Institute of Chicago. The next gallery focuses on the consumer’s role in creating the fashion industry. Because this is a complex, historical topic, the curators and designers chose to set the scene with a wall-sized photo-reproduction of an engraving showing the interior of Le Printemps, one of the most popular department stores in Paris. Against this backdrop were quotations about the rise of the department store and its influence on French consumer culture in the nineteenth century. Emile Zola’s 1883 novel, Au Bonheur des Dames served as a prime example of what was then a new building type, and one that was surprisingly controversial at the time. 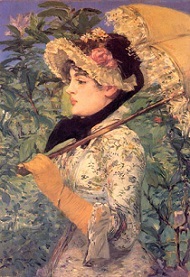 While certainly not as embarrassing as being caught cribbing from Wikipedia, misreading department store Printemps as Manet’s “Le Printemps” is surely not how Vogel was hoping her first post-plagiarism scandal NYT article would go.